The global solar energy market’s unprecedented growth has resulted in the twin challenges of delivering ever-higher performance and at the same time cutting generation costs. SKF has developed specific industry solutions that are designed to deliver lower total cost of ownership by providing a levelized cost of electricity through higher performance, lower maintenance requirements and longer product life. Solar electric energy demand has grown by an average of 40 % a year over the past two decades against a backdrop of rapidly falling costs and prices. Consequently, solar equipment manufacturers and operators are being challenged by the requirements of installing large systems that offer consistent generating performance over a lifetime of 20 years or more, ideally with minimum operating, maintenance and downtime costs. Further, the industry needs to continue driving down cost of the solar technology in order for solar to become fully competitive against fossil fuels. This means the industry has to find ways to maximize power output at minimal cost. The use of reliable and precise solar tracking solutions supports such cost-reduction ambitions. 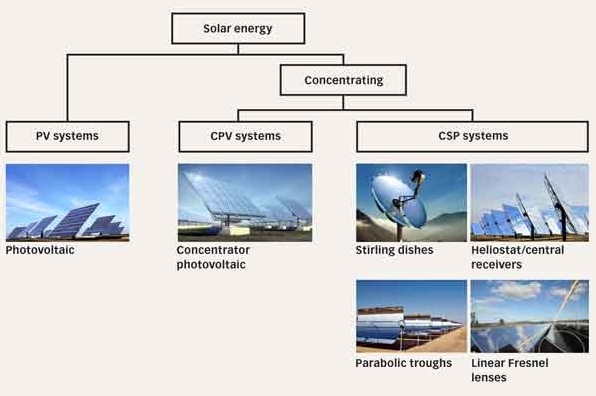 Whether it involves photovoltaics (PV), concentrating photovoltaics (CPV) or concentrating solar power (CSP) (fig. 1), SKF offers an extensive range of maintenance-free solutions related to solar tracking. 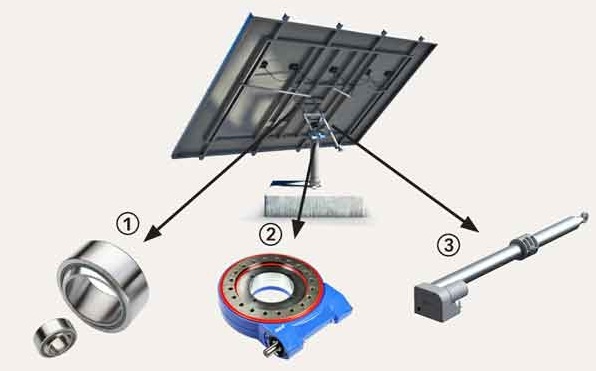 These encompass innovative products such as SKF Solar Linear Actuators (part of the SKF BeyondZero portfolio) and the SKF Solar Hub developed specifically for the solar market (fig. 2). Both products are designed, assembled, tested and validated by SKF. 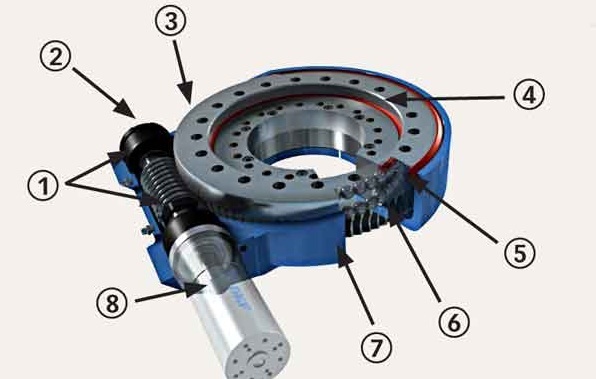 Furthermore, SKF provides maintenance-free bearing solutions with the possibility of integrating them with housings that are fully sealed for the life of the product. These specific solutions are also backed by more than 100 years of application engineering knowledge supported by the group’s engineering consultancy service. Bearings and mechatronics products are parts of an extensive platform of engineering solutions that also include lubrication and seals. In addition, SKF is a world-class volume manufacturer that can offer a global service to the international solar market. 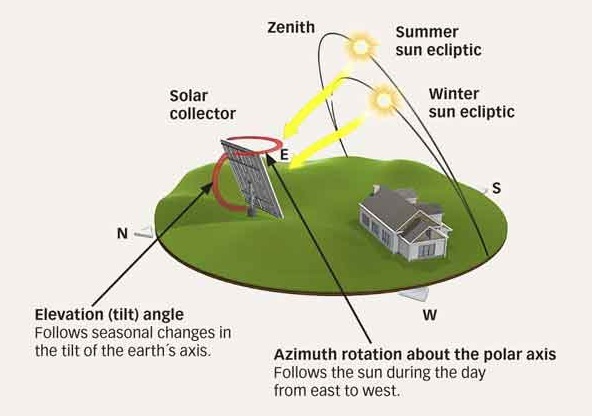 Tracking systems are important features in efficient solar power generation as they help to increase the power output of photovoltaic panels – a dual-axis tracker can raise it by up to 40 % – and to fully capture the sun’s radiation for CPV and CSP systems (fig. 3). To maximize energy generation, these systems need to have high performance characteristics such as robustness and accurate positioning, as well as providing a reliable solution capable of operating in harsh outdoor conditions. A solar tracking system has to track the sun with a certain accuracy depending on the technology. PV technology tracks the sun within ± 1 degree, while CPV technology tracks the sun at ± 0.1 degree. Hence, it is important to have drive systems without too much play, or “backlash”. Otherwise, as the wind blows, the system will rock back and forth, either losing efficiency or not generating any power at all. SKF offers globally all the drives and components needed for solar tracking applications with the added benefit that they are virtually maintenance-free. Electromechanical actuators, such as the Solar Linear Actuator and the Solar Hub, are used in tracking systems to move the solar panel in an east-west direction (called “azimuth” movement) or a north-south direction (called “elevation” movement), or both. The solutions encompass an azimuth function thanks to the SKF Solar Hub, an elevation function with SKF’s solar linear actuators in the CASD series, plus appropriate bearings from SKF’s extremely wide assortment (fig. 2). Such solutions are suitable for most types of solar generation – photovoltaic panels, concentrating photovoltaic panels and concentrating solar power systems such as parabolic troughs, heliostats or solar dishes. The Solar Hub (fig. 4) is the latest product from SKF designed to help increase the efficiency of solar tracking systems. Designed to custom solar requirements, it accurately tracks the sun from sunrise to sunset, throughout the seasons, over the life of the system. The technology offers significant improvements over today’s maintenance-intensive solutions. Designed for a 20-year service life, SKF Solar Hubs require no downtime for part changes and do not need relubrication. Robust design features such as superior mater­ial selection, optimized material treatments, improved lubrication and optimal sealing mean that the product is built for harsh environments and extended service life. The SKF Solar Hub reduces operational costs, lowering the total cost of ownership. With its minimized backlash, the Solar Hub enables improved power gener­ation, lowering the levelized cost of electricity (LCOE). The Solar Hub, CRSD 290 (fig. 5), has been designed specifically for solar tracking applications covering a wide range of panel sizes from about 20 to 70 m2 and can go as high as 90 m2, depending on the tracker design and wind conditions. The CRSD 290 is a rotary drive consisting of a preloaded main bearing arrangement, gear set and housing. The preloading during assembly provides minimal backlash tracking. The worm gear set is designed to have self-locking properties, enabling it to hold a static torque without an external brake. Additionally, the material selected for the gear set combined with appropriate heat treatment offers high torque-carrying capabilities and limited wear, extending product longevity. 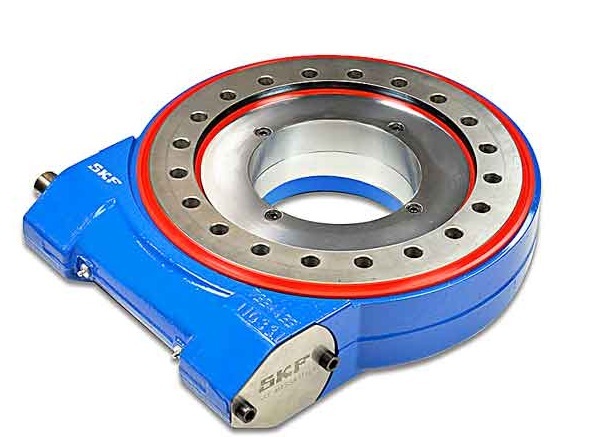 In the SKF design, sealing has been optimized compared with existing market standard solutions, to provide minimal grease loss during operation, to reduce any environmental impacts as well as reducing the need for relubrication. Thanks to SKF’s knowledge of greases and lubrication, an optimal grease has been selected for this slow-moving application, thus permitting an improvement in performance. As reduction in maintenance requirements has been a key design criterion, the CRSD 290 is virtually maintenance-free, requiring no maintenance over 20 years, in contrast with existing market standards that require annual relubrication. Finally, the complete design is protected in a sealed housing for optimal performance even in extreme conditions and is rated IP 65. The Solar Hub has the option of having an integrated motor and electronics to provide a fully integrated solar solution. The CRSD 290 Solar Hub could be integrated with an AC or DC voltage motor that could be mounted on either the right side or left side of the Solar Hub. SKF’s range of linear actuators, CASD-20 and CASD-60 (fig. 6), have been developed to meet the same high performance standards as the Solar Hub in terms of increased power generation combined with long life, reliability, ease of installation and no need for maintenance. The linear actuator comprises a screw with an integrated gearbox, motor, bearings, lubricant, two limit switches, hall sensors and a circuit board, all protected in a sealed housing (fig. 7). In this case, performance is achieved through the use of sealed protective tubes for improved reliability and better drive protection even in the harshest environments. Higher static to dynamic load ratios permit solar power generation even during high wind conditions. For the CASD-20, the respective dynamic and static loads are 5 kN and 20 kN. For the CASD-60, these values are 12 kN and 60 kN. Depending on the static load, both actuators have a stroke of up to 1,500 mm and speed of operation is up to 2 mm/s for the CASD-20 and 2.5 mm/s for the CASD-60. The CASD linear actuators deliver efficiency improvements such as reduced current consumption, greater positioning accuracy and limited backlash. Being complete units, not only are the actuators easy to install in any solar application, but they significantly cut design and development time while delivering savings in operation. For PV systems, solar tracking increases efficiency or power output by up to 40 % by using a two-axis tracking system incorporating SKF Solar Hubs. For CPV and CSP, the technology needs solar tracking systems to function properly, so solar tracking is essential for concentrating technologies. To minimize costs, it’s important that the technology uses a solar tracking system that reduces the total cost of ownership through an easier and faster installation, minimizing maintenance intervals if not completely eliminating them, and through a reliable product that does not require field replacement or repair. Solar equipment producers and operators alike can gain from working with SKF. By working in partnership, manufacturers gain the benefit of SKF’s broad engineering design expertise and manufacturing efficiency. This can lead to improved quality and customer satisfaction while avoiding expensive warranty work. Operators experience lower solar system lifetime costs through more reliable systems that can generate more power for a longer duration. By Markus Behn, global business development manager, Solar Energy Segment, SKF Gmbh, Langenhagen, Germany, solar@skf.com.